Instantly upgrade your entire bathroom with this PREMIUM shower caddy by AMG. These bathroom accessories add more glamour to the interior of your space and give it an artistic touch. If you want to increase the elegance of a room, then you must choose the best design which is suitable for your room's glory. But while choosing the design of a bathroom storage caddy, the artistic finish is not the only criteria. You must also consider the material and quality of the product. The shower storage accessories must be durable and high quality so that they don't break or rust. AMG shower caddies are the best option for you to choose while shopping for bath accessories. The AMG free standing caddy is made from premium quality materials. Its well-designed, sturdy structure adds to the decor and interior of any room. The caddy will withstand wear and tear, and keep your room looking great for a long time. Ordinary shower caddies can falter with time, but AMG provides you with a quality product that lasts. 3 Spacious Shelves to store towels, soap, tissue, books, wet wipes, perfume, makeup, and more! 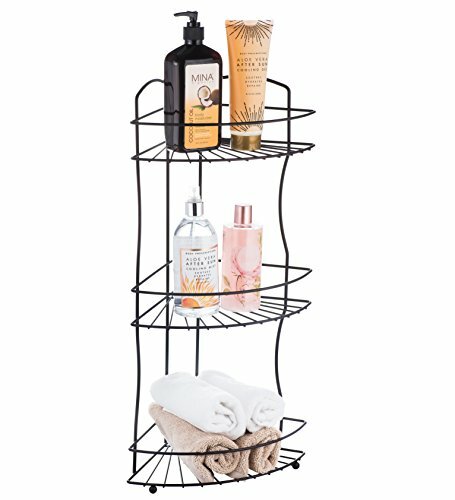 Free Standing design allows holder to be placed anywhere on your counter, perfect for small bathrooms , large bathrooms, apartments, or dorms. Conveniently fits into corners to maximize efficiency. If you have any questions about this product by AMG, contact us by completing and submitting the form below. If you are looking for a specif part number, please include it with your message.